How to Train Your Dragon has grown up in more ways than one. The sequel to the original animated charmer takes place five years later, and it's filled with vast and stunning landscapes, even more endlessly inventive dragons, and a more mature story. Despite a few hiccups in its plot, it's a movie to make hearts soar. How to Train Your Dragon 2 opens on the island of Berk five years after the last movie ended. The viking stronghold has been completely transformed now that the population rides dragons instead of hunting them. The ingenuity and joy that went into the new film is apparent from the opening scene; perhaps Berk could start a new vikingpunk movement integrating inventor Hiccup's (Jay Baruchel) new designs and the sorts of games dragon riders play. The Berkians' lives have been enriched by dragons, and they delight in their new peaceful existence. But Hiccup is restless. He has so much now—the admiration of his people, the respect of his father (Gerard Butler), an adorable relationship with his dragon Toothless—but he's not sure what his purpose is in life. Like the filmmakers themselves, he finds himself chafing against the confines of Berk and decides to map the larger world and catalog the dragons within it. 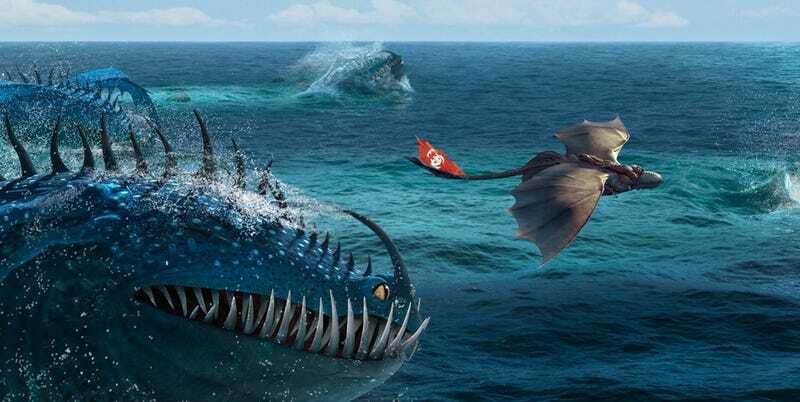 There are dangers and delights beyond Hiccup's island home. While Berk may have become a dragon-loving paradise, there are people in the wider world that want to harm or capture dragons. Hiccup and Astrid (America Ferrera) encounter a group of dragon trappers, led by Eret (Kit Harington—who gets to show off far more swagger than he does in Game of Thrones) and working for a mysterious warlord named Drago (Djimon Hounsou). But Hiccup also meets the dragon riding vigilante Valka (Cate Blanchett) and discovers a secret dragon sanctuary. As the outside forces of the world threaten both Berk and the wild dragons, Hiccup must grow into himself and figure out whether he can truly become a leader. How to Train Your Dragon 2 is a movie built for the theaters. The filmmakers have not squandered their time outside of Berk, taking us through ice fields and fjords and seaside crags and even cloudscapes that make you feel like you're flying through a real world. And the choreography of the flight scenes—Hiccup is a bit of a daredevil—make conscious use of the big screen and the 3D. Even if this were a mediocre movie, it would be immense fun to watch. The filmmakers never forget, however, that animation is more fun when it breaks the bonds of realism. There is some truly fabulous cartooning in this film, from the placid expressions of Berk's much abused sheep to the flare of dragon fire behind enormous teeth in the darkness to the majestic creatures that are even stranger and grander than what we saw in the first movie. This is a fantasy story, and the look and feel of How to Train Your Dragon 2 transports us to a place where we can believe dragons exist. At the same time, the animation does a lot to convey character and relationships. It's hard not to grin each time Hiccup and Toothless tussle with one another (and the sound design for the dragons continues to delight) or feel unnerved by Valka's preternatural grace. The animation team has really stepped up its game with this installment, and I can only imagine what they'll bring to the table in the third act. Part of what made the first How to Train Your Dragon so wonderful was that it was, at its heart, a very simple story. The sequel is a bit more ambitious, because it's telling not just Hiccup's story, but also those of Eret, Stoick, and Valka. The movie can feel overstuffed in places, but when it works, you can feel a beating heart behind everything. Part of growing up is realizing that adults are people, too, and Hiccup's growth process isn't just about self-discovery; it's about understanding the history and values of the people who came before him. As the adults get their own story, their own special moments, Hiccup receives some powerful models for forgiveness, conservation, and leadership. It's a story that very nearly works, and as we clip along into the film's second act, it looks like How to Train Your Dragon 2 is going to pull off something quite remarkable. But is it still appropriate for the little ones? Kids will love the colorful scenes and the visual humor, but for smaller children, this outing might be a bit intense. Expect this one to be both scarier and sadder than the original, and plan accordingly. Unfortunately, the story hits a bit of a wall with the appearance of our villain, the fearsome Drago. Drago is presented as the anti-Hiccup, as domineering as Hiccup is compassionate. Unfortunately, he's not much more than that. The best animated movie villains have personality and flair; they may be evil, but they light up the screen. Because Drago's sole character trait is his desire to assert his will over others, he does little more than that, and his story doesn't mesh with the rich and complicated people he's sharing the movie with. Still, the film's climax manages to be satisfying, even if Drago himself isn't. Even if How to Train Your Dragon 2 didn't quite hit the moon it was shooting for, it still contains the charm, humor, and heart of the original with a more mature story and breathtaking visuals. We can certainly believe by the end that Hiccup has grown up through the events of the film, and that director and writer Dean DeBlois—who co-wrote and co-directed the original film as well as Lilo & Stitch—continues to grow as a visual storyteller. It's not just a delight to watch; it also leaves us excited to see what's coming next.